The final Penn State Extension Master Gardener Public Class of the year will be held Tuesday, Sept. 18, at 6:15 pm at the Master Gardener Demonstration Garden on Fourth Street in Towanda, across from the YMCA pool. Master Gardener Nancy Menio will discuss the 3M’s of Monarch Butterflies: Milkweed, Migration, and Mexico. 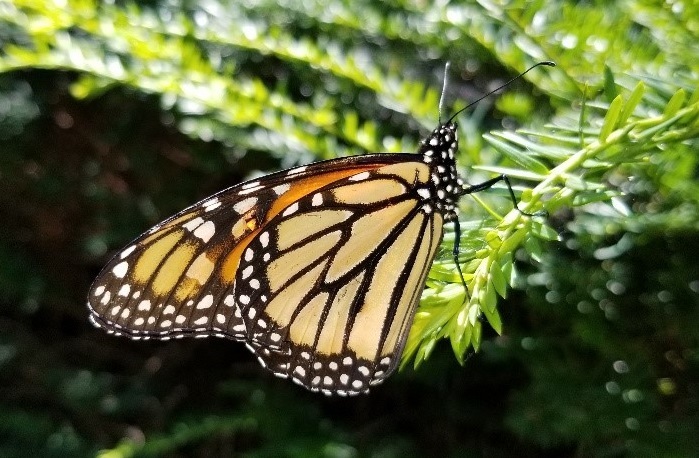 Nancy will discuss the life cycle of the monarch butterfly and importance of the milkweed plant in both the monarch butterfly life cycle and to the insect community in general. In addition, she will discuss the monarch migration: estimated arrival times in the spring, departure times in the fall, the number of generations between arrival and departure, and where the butterflies spend their winter vacation. Finally, Nancy will highlight concerns associated with monarch populations and how the public can play a role in becoming a Citizen Scientist. This class includes some hands-on activities as well as a closeup look at the stand of milkweed at the Demo Garden. Bring your lawn chair for the “sit-down” portion of this outdoor class, but be prepared to move around as well. In case of inclement weather, classes will be held at the Penn State Extension Office, 200 Main St., Suite 3 in Towanda. This class is free of charge; registration is not required. Keep up with all the local Master Gardener activities and events by following our Facebook page, Penn State Master Gardeners of Bradford & Sullivan Counties. If you have questions, please call the Extension Office at 570-265-2896. The Pennsylvania State University encourages qualified persons with disabilities to participate in its programs and activities. If you anticipate needing any type of accommodation or have questions about the physical access provided, please contact the Extension Office at 570-265-2896 in advance of your participation or visit.